(SPOILERS) During the decade between The Terminator and True Lies, Arnie could barely put a foot wrong commercially, and often critically too (what he did with his hands was another matter entirely…) But then it all went pear-shaped. It would be another decade before he began governating, but movie-wise he made dud choice after dud choice; the best you could say of the best of his output during this period is that it was passable. The worst…. 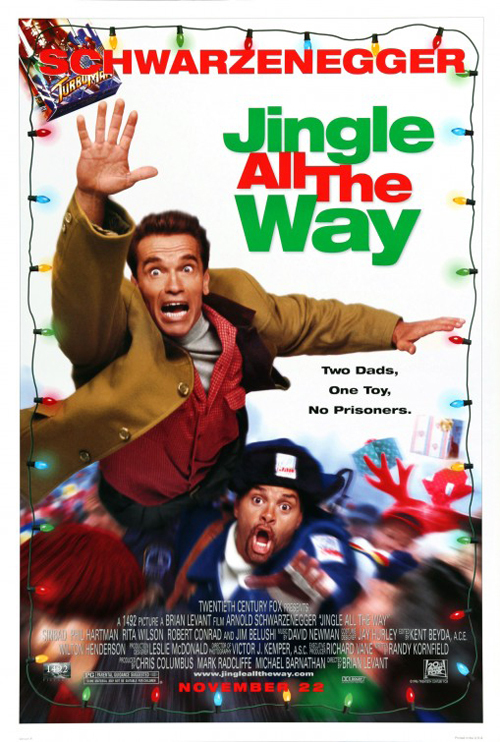 Jingle All the Way is generally regarded as one of his stinkers, a nadir that resulted from going back to a well that had little to yield after a deceptively full first bucket or two (Twins and Kindergarten Cop gave way to Last Action Hero and Junior). The novelty value of “comedy” Arnie wore off quickly, and the shrewd businessman who sought out James Cameron, Walter Hill and Paul Verhoeven was now taking notes from the guy who directed Beethoven. 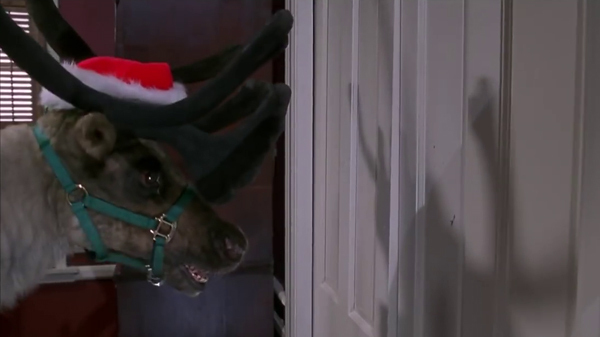 But it’s a Christmas movie, right? 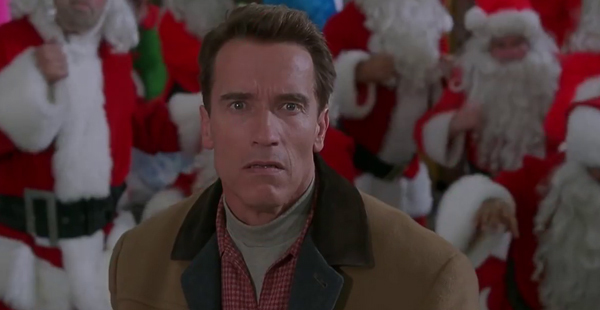 Arnie has to have a Christmas movie on his CV (aside from the he’d already directed one for TV). It wasn’t as if Arnie’s nous had entirely deserted him, more that he’d miscalculated, and once you’ve done it once, errors start to accumulate. He’d have been better off going on a Crusade with Verhoeven or being the last man on Earth for Ridley Scott (it was the delayed-then-entirely-off Planet of the Apes for Philip Noyce that led to a Jingle-sized window in Arnie’s schedule). A medium-budgeted Yuletide slog can often make an appreciable profit by coasting on the festive brio of undiscerning patrons, but if you’re going to spend $75m on a comedy (Arnie’s $20m price tag is at least part of the answer to the question of why it was so pricey) you need to be able to guarantee a big hit (it made about $60m in the US, and just over the same again internationally). Producer Chris Columbus had delivered John Hughes’ Home Alone to audiences as director. Levant had directed… The Flintstones. The incredibly named Randy Kornfield hadn’t previously written anything of note, and wouldn’t again (Columbus rewrote the thing; you’d have thought, having been the originator of one of the most jaundiced Crimbo blockbusters, Gremlins, he’d have been a bit sharper). The gist of the pitch is evident enough; make a festive box office packet soft-selling a cautionary tale in which a wee nipper realises that all he wanted for Christmas was dad, while dad simultaneously gets his priorities sorted… Except that Arnie’s Howard Langston is no Scrooge in the scheme of things, so doesn’t even have an appreciable distance to go to become a better man; he puts work first, and fails to show up to each and every one of his munchkin’s doubtless tedious karate belt graduations (I mean, give him a break, they’ll all be the same after the first couple). It’s the desire to get his son a prized Turbo-Man doll that undoes Howard, leading him to indulge in a barrage of disreputable behaviour – including accidentally setting neighbour Ted’s house on fire while attempting to steal his son’s Turbo-Man doll – and gets rewarded for it with junior’s abiding affection. Do I buy that the moppet would then give away his toy because “What do I want the doll for? I’ve got the real Turbo-Man at home”? Not for a second. 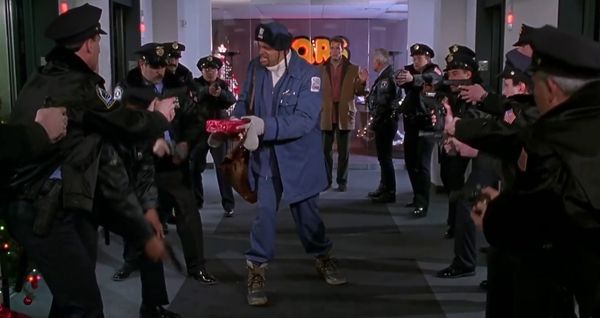 The ongoing duel between Howard and Sinbad’s postal worker Myron Larabee has potential; Arnie and Sinbad are reasonably well matched as sparring partners, and the originally suggested Joe Pesci might have been a little too evocative of Columbus’ earlier Christmas treat(s). There’s scope for some solid slapstick in their ongoing scrum, reminiscent of Pesci and Stern repeatedly coming a cropper at Macauley Culkin’s psychotic hands in Home Alone. Sinbad’s dyspeptic attitude also makes for a fun contrast to Arnie not quite knowing where he is (he isn’t the straight man, he isn’t the hero, and when he’s doing anything else, he resembles a inert block of buff cardboard); “We are being set up by right and powerful toy cartels” warns Myron early in the proceedings. He also gives good pratfalls. Blasting out “It’s the most wonderful time of the year” over a consumer feeding frenzy montage isn’t subtle, but it does raise a smile. Put Arnie on a back foot in a scene, though, and the incongruity does still tend to pay off. His seething jealousy of Ted, Phil Hartman’s too-good-to-be-true lecherous neighbour (who suddenly became extra helpful and a great dad when his wife left him; now all the wives think he’s the business) is amusing, and Hartman revels in Ted’s shameless inveigling (“He’s in my house, putting up my star!” exclaims Howard). 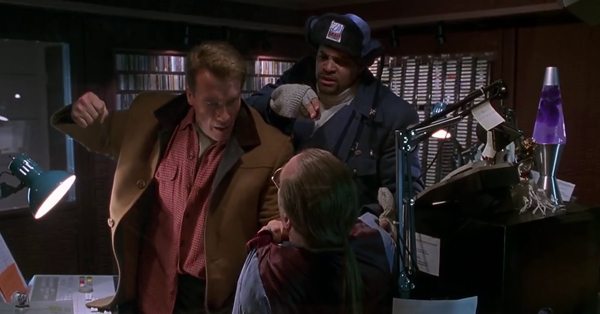 Another scene finds Arnie on an ice rink fending off outraged parents – “I’m not a pervert. I was just looking for my Turbo-Man doll” he protests. Not a scene you’d expect to get okayed in the current cultural climate, and probably not the best defence against levelled charges, any more than Sinbad claiming he’s carrying mail bombs (ah, more innocent times). 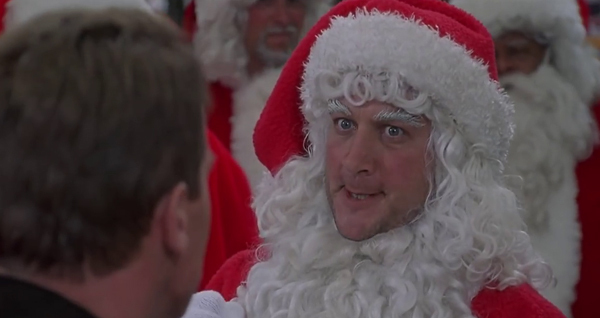 John Belushi, Arnie’s old Red Heat sparring partner, shows up as a pre-Bad Santa bad Santa (complete with opprobrious elf). There’s an amusing daft sequence in which Howard sets to on a warehouse full of Santas, complete with flying Santa dwarf, after Belushi has palmed him off with a Mexican Turbo-Man that promptly falls apart. At another juncture, Arnie punches out a reindeer (a homage to Conan the Destroyer, although it sounds weird suggesting anyone might want to homage Conan the Destroyer). 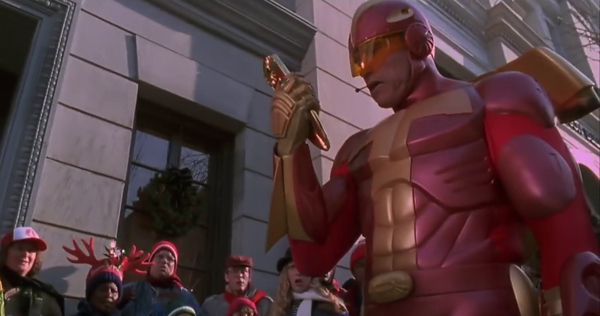 The action climax at the Christmas parade, in which Howard dresses as Turbo-Man (and, inevitably, Myron as archenemy Demento), is as slipshod and uncoordinated as you’d expect from Levant, and replete with indigestibly stodgy, sentimental guff (“Thanks, Turbo-Man, I knew you’d save me”). It bears noting that, while Rita Wilson (Mrs Tom Hanks) is note-perfect as Howard’s wife, munchkin Jake Lloyd is about as effective here as he would be in The Phantom Menace a few years later. That’s what comes from having the Austrian Oak offering notes during your formative acting experience. 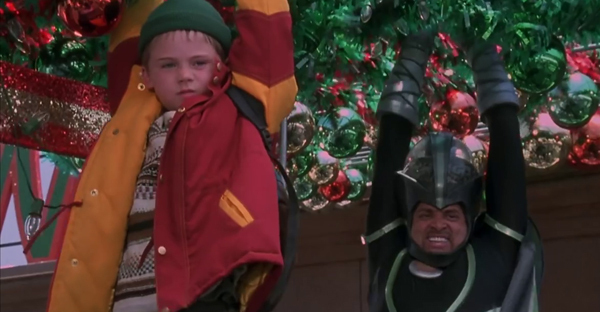 Jingle All the Way isn’t very good, but mercifully neither is it a slog to get through, in contrast to certain Arnie pictures during this period (step forward Batman & Robin). 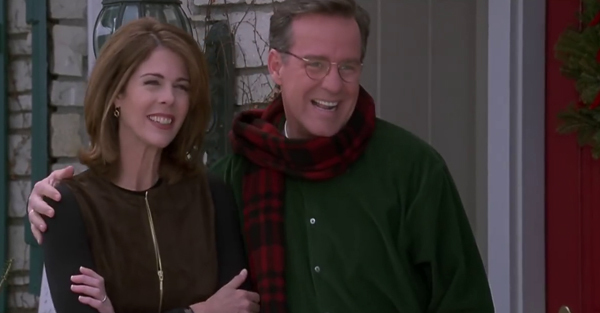 You can fully see why Tim Allen – whose Christmas movie whorishness was only surpassed by Vince Vaughn during the following decade – was up for the lead part, and the picture’s cake-and-eat-it shamelessness, and general “that’ll do” quality (like everything Levant directs, it could have been made for TV) mean you’re under no illusions about it being exactly what it is.